LONDON — Donald Trump issued scathing criticism of Prime Minister Theresa May’s Brexit strategy during his visit to Britain, as campaigners planned a mass protest against the US president on Friday. In a series of extraordinary broadsides, Trump told Friday’s edition of The Sun that May’s plan for post-Brexit ties with the EU would "probably kill" the prospects for a trade deal with the US. Trump also said former foreign minister Boris Johnson, who resigned this week in protest over the plan, would make "a great prime minister". He said London mayor Sadiq Khan, who has allowed protesters to raise a giant diaper-clad balloon mocking the US president next to parliament on Friday, was doing "a terrible job" on crime. The comments will plunge the transatlantic "special relationship" to new lows, making for extremely awkward talks with May when the two meet at her country retreat of Chequers later on Friday. As he began a four-day visit to Britain on Thursday, Trump, a major supporter of Brexit, told The Sun that he had advised May to go about leaving the EU in a different way but was ignored. "I would have done it much differently. I actually told Theresa May how to do it but she didn’t agree, she didn’t listen to me. She wanted to go a different route. "I would actually say that she probably went the opposite way. And that is fine. She should negotiate the best way she knows how. But it is too bad what is going on," he told the tabloid, Britain’s best-selling newspaper. Referring to the Brexit blueprint, which was outlined by the government on Thursday, he said: "The deal she is striking is a much different deal than the one the people voted on. "It was not the deal that was in the referendum. I have just been hearing this over the last three days. I know they have had a lot of resignations. So a lot of people don’t like it," he said. May is facing a rebellion by Brexit hardliners over the proposals, including the resignation of Johnson and Brexit minister David Davis this week, although moderates and big businesses have been supportive. May has insisted that her Brexit plan will allow Britain to strike its own lucrative trade deals with countries like the US after her country has left the bloc as planned in March next year. 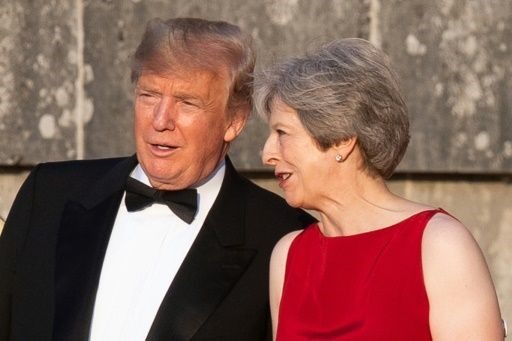 She pressed Trump about the deal on Thursday at a gala dinner at Blenheim Palace, the birthplace of Britain’s World War II leader Winston Churchill. Brexit "creates an opportunity to reach a free trade agreement that creates jobs and growth here in the UK and right across the United States", she said. But Trump poured cold water on May’s offer. "If they do a deal like that, we would be dealing with the European Union instead of dealing with the UK, so it will probably kill the deal," he said. Trump flew into Britain on Thursday, having already subjected NATO allies to a roasting over their levels of defence spending. The president spent the night at the US ambassador’s residence located in a London park behind a "ring of steel" fencing, stalked by noisy demonstrators. White House spokeswoman Sarah Sanders later told reporters Trump was "thankful for the wonderful welcome" he received in Britain. "The President likes and respects Prime Minister May very much. As he said in his interview with the Sun she ’is a very good person’ and he ’never said anything bad about her’," she said. The agenda for Trump and May on Friday includes discussion on relations with Russia, ahead of a summit in Finland on Monday between Trump and President Vladimir Putin. Putin’s government is accused by May’s of unleashing a deadly nerve agent in the English city of Salisbury. Moscow denies the charge, and Trump has given no indication that he intends to raise the issue with Putin. Trump will later Friday take tea with Queen Elizabeth II at Windsor Castle, before spending the weekend in Scotland on a private visit that will likely take in 18 holes at one of the property magnate’s golf courses, where more protesters await him. While his schedule studiously avoids any high-profile events in London, the British capital will see a mass demonstration and rally Friday, one of several protests across Britain including a tuneful one by a group of opera singers.